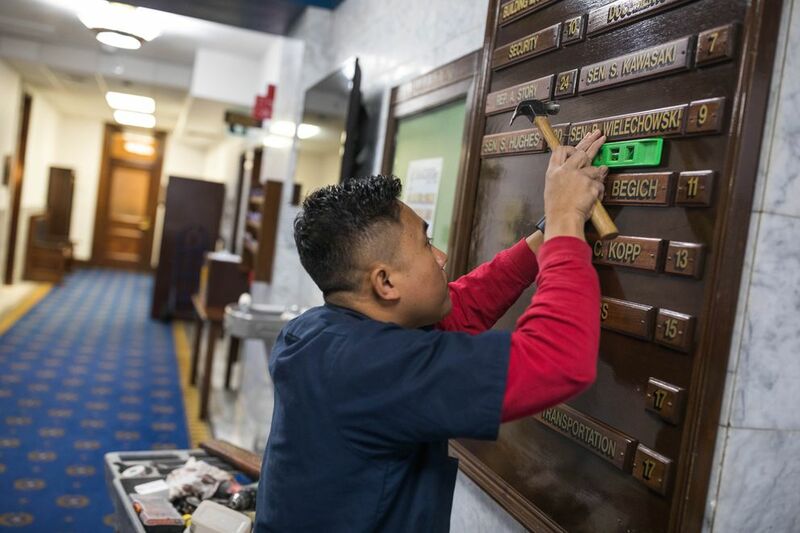 JUNEAU — Lawmakers remained stymied in their efforts to assemble a governing coalition Monday, the day before the start of the 31st Alaska Legislature. Throughout the day, Republicans, Democrats and the House’s lone independent gathered off and on behind closed doors as they attempted to assemble a coalition that includes at least 21 of the House’s 40 members. At the end of the day, lawmakers themselves said they didn’t know much about what to expect Tuesday. 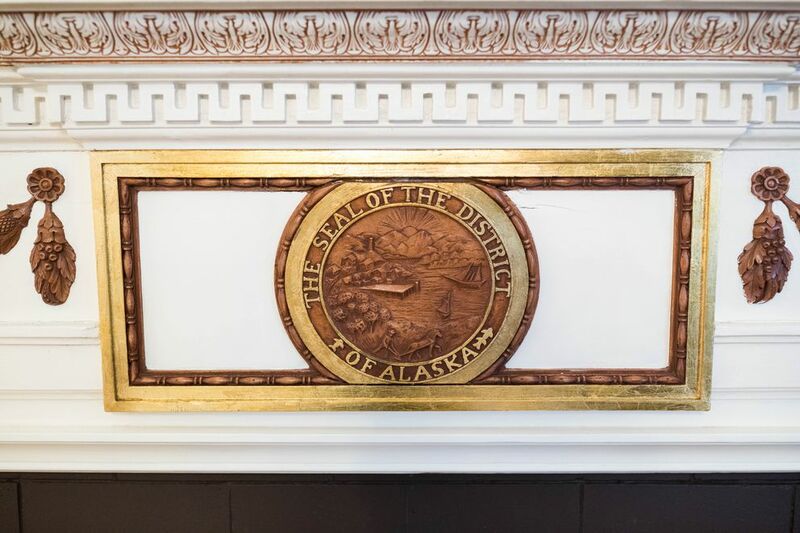 “The lieutenant governor’s going to be in the hot seat, and we’re going to get sworn in, and that’s about all I know,” Rep. Gary Knopp, R-Kenai, said about Tuesday’s official start. 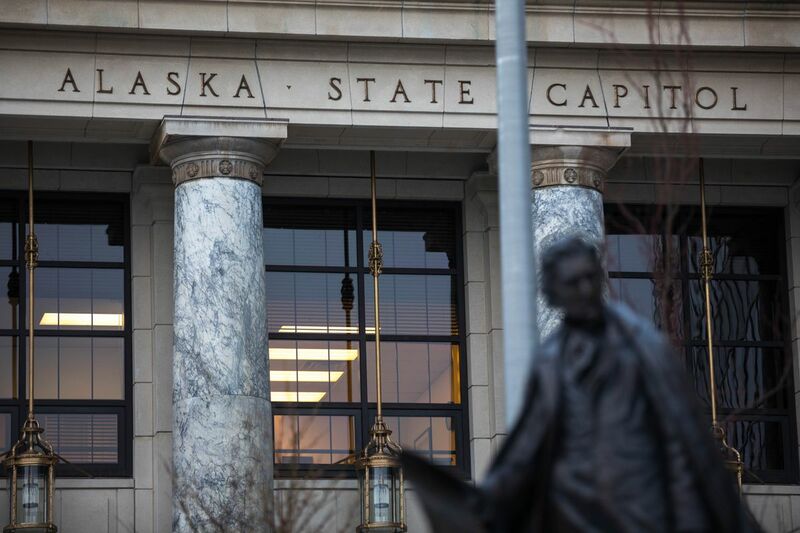 While events in the Alaska Senate are expected to be ordinary for the first day of Alaska’s two-year legislative session, the situation in the House remains undetermined, multiple legislators said. Twenty-one affirmative votes — a bare majority — are needed to confirm a speaker of the House and conduct most business in the House. There are 19 remaining members of last session’s 22-member mostly Democratic majority coalition. After Election Day in November, 21 Republicans met and announced the creation of a new majority. Afterward, Knopp left that group, saying a bare-minimum majority was unsustainable. By leaving, he hoped to force the creation of a broader majority coalition. That hasn’t happened, and now the consequences are about to begin. Without a majority, lawmakers cannot hire staff, cannot determine committee assignments and cannot introduce legislation. 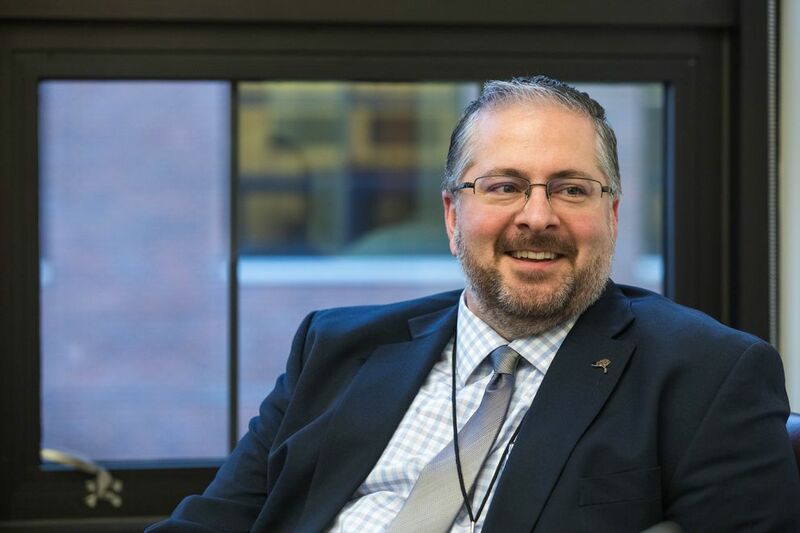 “Staff who do not have authorization ... should not work past January 15, 2019,” the Legislature’s legal affairs director, Skiff Lobaugh, wrote in a memo dated Jan. 10. “Staff in a legislative office fills a very important role,” said Josh Applebee, chief of staff to Lt. Gov. Kevin Meyer and a former staffer. “If you don’t have staff, then you don’t have anybody to answer constituent questions that come in, and they come in constantly,” Applebee said. “Twelve (thousand) or seventeen thousand people in each district are getting a voicemail that says you’ve reached — and it might not even be the right representative’s name." With no committees working, legislation — including the state budget — cannot be introduced into the House or advance through the process. While the deadline for passing a budget is months away, the longer a deadlock lasts, the greater the chance that lawmakers will exceed the voter-approved 90-day session limit or the 121-day constitutional limit. “I think the most important thing is that it doesn’t go on too long,” said Rep. DeLena Johnson, R-Palmer. Rep. Louise Stutes, R-Kodiak and a member of last session’s coalition majority, thinks it won’t. Applebee is dealing with another consequence of the impasse. The lieutenant governor is the House’s presiding officer until a temporary or permanent speaker of the House is elected. The lieutenant governor’s duties in that role are limited. In an ordinary year, he (or she) certifies the results of the November election and swears in new legislators before taking nominations for someone from the House to lead the body. In November, Republican Nancy Dahlstrom was elected to represent House District 13 but chose to become Gov. Mike Dunleavy’s corrections commissioner instead. 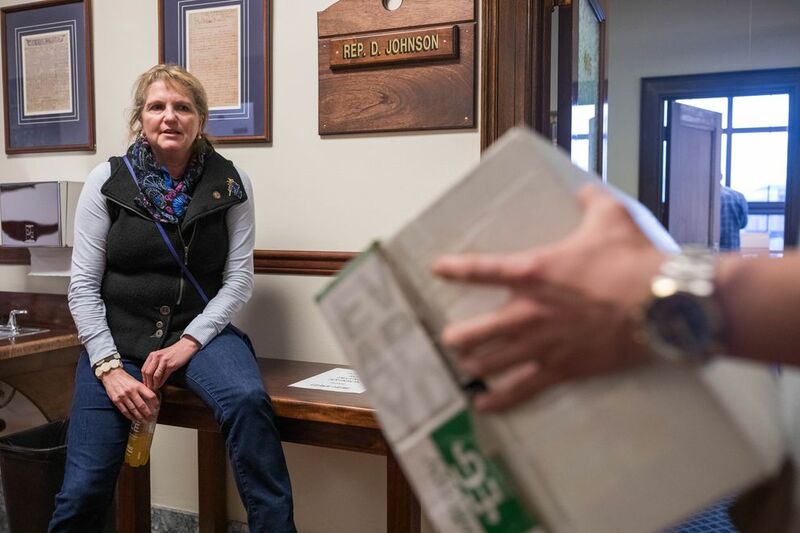 Dunleavy selected Sharon Jackson to replace Dahlstrom, but Applebee doesn’t believe the lieutenant governor’s powers include the ability to accept the governor’s choice unless the House approves. “Should the House say as a body, we want to do this, they can, I suppose,” he said. Last week, Rep. Dave Talerico, R-Healy and the prospective Republican speaker of the House, said Jackson did have enough support from fellow Republicans to be seated. By 5 p.m. Monday, with Tuesday’s plan still unclear, the prospective deal-making appeared to draw to a close. Monday is the last day of campaign fundraising, which is banned during the legislative session. Republicans were scheduled to gather in a Juneau ballroom that hosts the Juneau Chamber of Commerce during the session. Democrats had an event scheduled in the Juneau-Douglas City Museum. Senate President Cathy Giessel offered a multipartisan reception in the former Legislative gymnasium as a third choice. Pruitt, talking in the Capitol’s fourth-floor hallway, said Alaskans shouldn’t view the impasse as negative.